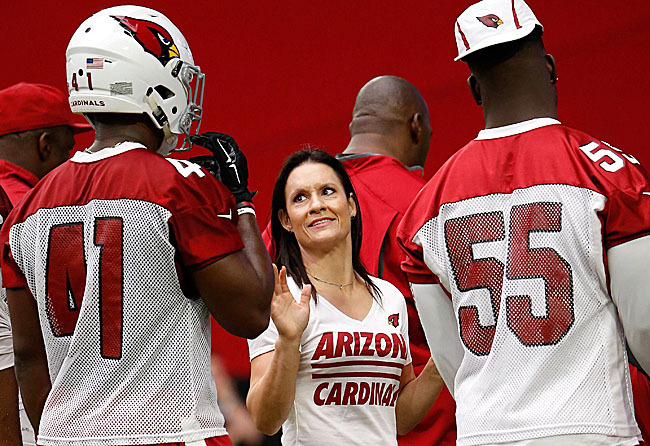 My name is Jen Welter and I am the NFL’s first female coach. To be exact, I am a training camp and preseason intern with the Arizona Cardinals, working with inside linebackers. By now, you may know my story. I played 14 seasons of pro football, including a season of playing running back and special teams for the Texas Revolution of the (previously all-male) Indoor Football League. I also coached for the Revolution and have a PhD in psychology. But here I am, at 37, with the opportunity of a lifetime. I am so thankful to head coach Bruce Arians, a forward-thinker who is not afraid to be different. Bruce doesn’t see race or gender, he only sees talent and passion. This hiring also speaks extremely highly of our owner, Michael Bidwill, and our general manager, Steve Keim, who supported Coach Arians in this decision and have embraced me here in Arizona. I am so honored that people have gravitated to my story. The media support has been tremendous, and I feel blessed to have this platform available to inspire others. I’ve conducted interviews with outlets like Time Magazine, my introductory press conference was streamed on NFL Network and I won’t hesitate to press retweet if someone congratulates me on Twitter (especially if that person is Vice President Biden). I knew when they hired me it was going to receive attention, only because that’s what happened when I played. I had no idea—well, maybe a small, microscopic idea—it would be this big. Not to this extent. Why do I put myself out there like this? 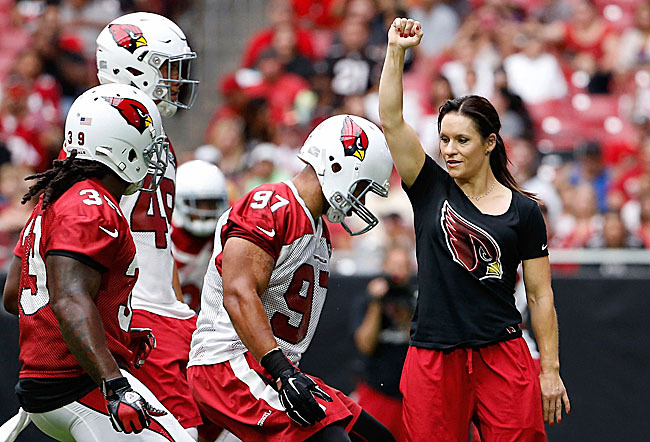 Well, football has often been referred to as the final frontier for women in sports, so for an NFL team to have brought a woman into the coaching ranks, that speaks volumes. It's an important step for girls and women to see. Being a woman is part of who I am. It's not all of who I am, and I’m not here just because I'm a woman. I'm here as a football coach. If my opportunity in the NFL is a chance to show other women what’s possible in this world, and to show guys that there is another dimension to a lot of women—that this game that they love can be loved and respected by a woman—why wouldn’t I highlight that? At the same time, my most important obligation right now is helping Coach Arians and this team. Let’s not ignore the fact that I am different than the tens of thousands of coaches who have worked in the NFL. And that’s O.K. It just means I bring a different perspective. Here’s how: Think of NFL rosters. How many of these guys grew up and their mom was their whole world? How many grew up being raised by a single mother? How many of them have heard their mom say, I don’t care how much money you make, you better go do your job and do the right thing? So many of these guys have learned from women. When I instruct players—and I saw this at my last job—it feels comfortable for them. My approach may take away a little bit of that head-to-head male competition. I want to help guys realize football is as mental as it is physical, and that I’m invested in their future. When guys know they are cared about as a person, and not just a player or a commodity, they will absolutely play harder. My position with the Cardinals is all about balancing learning and teaching. The playbook is several inches thick, so I have a lot of studying to do. I really wish I had photographic memory. I’m lucky to have wonderfully supportive coaches around me, especially Larry Foote, who is my mentor. Larry has played this playbook, he knows it inside and out. The best thing I can do is reinforce what Foote wants our linebackers to accomplish, and what defensive coordinator James Bettcher wants our defense to look like. I am focusing on attention to detail and technique with individual players, and the players have been very receptive. To see tweets from Kevin Minter and Patrick Peterson welcoming me just as “coach” felt profound. Those guys are leaders on the Cardinals, and for them to make feel comfortable, with no qualifiers or this or that, meant the world. Other outpouring of support simply overwhelmed me. Madeleine Albright knows who I am, that I exist on this planet? Hillary Clinton? That's a woman who has come so far in politics. She could be our next president. And she’s excited about what I’m doing in football? If you want to know what the NFL means in American culture, look no further. This, to me, shows progress. I’m not the only woman making headlines lately in male-dominated sports. Look at Becky Hammon, who coached the Spurs to a summer league title. Look at Ronda Rousey, the top-billed fighter in UFC, and at one point they didn’t even want her to fight. Look at the love people showed for Mo’ne Davis when she played with the boys. I won four championships and two gold medals and I was never asked to go on ESPN. None of us were. My opportunity could create other opportunities, and I love everything about that.